FOIMan comments on a revealing annotation to a request made via WhatDoTheyKnow.com. In my experience, one of the most common causes for a FOI response being delayed is one that many FOI Officers are reluctant to publicly acknowledge. It is that often colleagues are less than cooperative. This can take the form of outright refusal to provide information; of foot-dragging; or simply of being awkward and aggressive. All of this goes on behind the scenes and is rarely exposed to sunlight. After all, FOI Officers have to remain professional and maintain good relations with their colleagues as far as possible. So we can be thankful to one academic who has thoughtfully published the internal email correspondence between themselves and their FOI Officer on the WhatDoTheyKnow website. The cause of this was a freedom of information request made through the site for the academic’s expense claims. They note that they are “far from impressed” with the handling of the request and that “‘work’ is often self-inflicted” by public bodies based on their experience. They ask us to “be the judge”. So let’s do that. What I strongly suspect the FOI Officer was attempting to do here was to consult the professor as to her views on disclosure – as advocated by the section 45 Code of Practice. In any case, it’s good manners. But it was worded a little loosely, so it’s kind of the professor to volunteer her assistance, even if it does take the form of a plug for her own book. There is subsequently a delay. Let’s remember that FOI Officers are dealing with lots of requests at the same time, not to mention having other responsibilities. So there may be good reasons why they don’t immediately come back to the professor. On the other hand, perhaps the response to their first email has made them reluctant to re-engage. The observant amongst you will note that the FOI Officer has already asked the professor – two weeks previously – how they want the request handled. And they don’t appear to have answered yet. 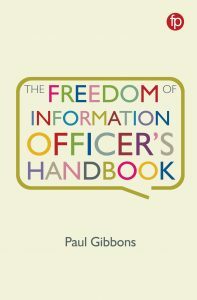 They do, however, go on to explain – you can almost hear the grinding of the gritted teeth that they’re talking through – how the FOI Officer should handle the situation should the staff member object. The professor of course being the staff member here. Still no indication of her actual view on disclosure though. She helpfully refers the FOI Officer to an Information Tribunal case. 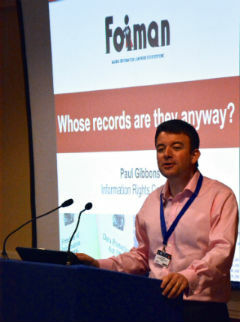 Not just any Tribunal case though: “my Information Tribunal case”. It’s worth noting here that whilst it is common practice to disclose expense claims by those in senior management positions, it is certainly not routine to do this for other members of staff. The Information Commissioner’s definition document for higher education institutions requires universities to publish totals claimed by “senior staff” – and defines this as staff earning over £100,000 per annum and on the senior management team. In my time as a FOI Officer in higher education I don’t recall ever dealing with a request for expenses claimed by academics outside senior management. A quick perusal of WhatDoTheyKnow confirms that such requests are rare. Recently the Commissioner accepted before the First-Tier Tribunal that academic salaries were exempt from disclosure in a particular case. I don’t know what academics at this university are told about their expense claims, but given the above, they may have been led to expect that disclosure was unlikely. If this is the case disclosure could well be unfair, which would support the use of the s.40(2) exemption to withhold expense claims by academic staff. So in the absence of a clear, unambiguous statement from the professor that they are content for their claims to be disclosed, I can understand why the FOI Officer would have proposed to withhold the information. They are not being defensive, merely adopting a default position that is perhaps reasonable in the circumstances. In any case, all the professor has to do is indicate that they don’t want their expense claims to be withheld and they can be released (which they know, as the quote above illustrates). No doubt occupied with other requests and duties, the FOI Officer takes a little while to go back to the academic again. By this point, they have started to suspect – again, without very much to go on – that the professor may want to disclose her expenses. So they ask whether she has claimed any. I don’t know why the information wasn’t being sought from the university’s systems. Perhaps the FOI Officer had already attempted to, had found nothing, and wanted to confirm this with the professor. Maybe – and boy, I can relate to this – they had experienced problems with data obtained from the finance systems previously and thought it might be easier to go straight to the horse’s mouth. But I do know one thing. The professor hasn’t answered the question. Or indeed, given their consent for the information to be disclosed. I’ve been a little flippant thus far, but I do think this illustrates a real problem for FOI Officers. If you take the handling of any FOI request out of context, you will see delays, and maybe questions that don’t make sense to the outside observer. It rarely helps improve matters to put individuals under pressure from the start by being unnecessarily unpleasant to them or publicly questioning their competence. It certainly doesn’t help if colleagues repeatedly fail to answer questions put to them by FOI Officers in their organisations trying to prepare responses. At best, the attitude displayed by this academic shows disrespect for a colleague trying to do a difficult job. At worst, it has contributed to delaying the response to the requester – the response is now overdue. The professor may be able to point to failings by the university’s FOI office, but she hasn’t exactly helped them. In her commentary on the request, she comments that the FOI Officer failed to pick up the phone – but it doesn’t appear that she has attempted this herself. At every stage she had the opportunity to indicate her willingness for the information to be disclosed, but instead chose to score points off a junior colleague, apparently to make a political point. Rudeness may be understandable – though not really – in someone who resents FOI, forced into the sunlight reluctantly. But if you’re someone who professes to champion FOI and has made their name by using it to hold others to account, you would think that you’d do everything in your power to assist a colleague to meet the Act’s obligations. So it’s odd that the academic at the centre of this sorry tale is one Heather Brooke – famed for being one of the journalists who pursued the disclosure of MPs’ expenses. By adding her annotation to WDTK it cannot be denied that she has enhanced transparency, but I’m not at all sure that it exposes what she intended. It’s just not a subject of request’s job to ring the FOIA office and say ‘Anything in about me?’ on the off-chance. It’s not in their job description. And it would create havoc if everyone did so. It’s the FOIA officer’s job to check with the subject for their decision… Because it’s their data. Nobody’s suggesting that this academic should have been checking what requests have come in relating to themselves. The FOI Officer told them a request had been received. It IS up to the subject to advise the FOI Officer of their view on disclosure. In any case, whilst communication breakdowns happen all the time in the workplace, what we don’t expect is for colleagues to publically criticise us and publish our correspondence – presumably without any warning. She could certainly have been more helpful, but imagine how much worse it would have been with someone who didn’t have a clue about FOI law/actively didn’t want to cooperate. She’s certainly not being actively obstructive. 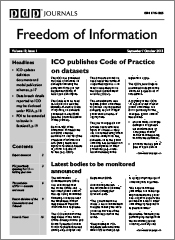 – Explicitly explaining the position under the FOI act in terms of withholding information in the first email. Why don’t they have a standard email that does exactly that? An open-ended vague question invites all sorts of responses that won’t get you any further down the road. – Not taking two weeks to turn around the first response. Yes, pressure of work and all that, but this was a perfect opportunity to actually explain what they wanted from the first email and doing so quickly would have been much more efficient for all concerned. 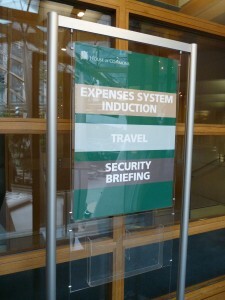 – Having a standard procedure to get at recorded information about expense requests. If the university’s systems are so disorganised that it’s easiest to ask the individual, then say so, but again be explicit about what you want. “Have you claimed any expenses?” is a classic “bad FOI request”. In Washington State, when a public agency is served a public records request a grand total of five business days are required to respond. So for the FOI officer to stall is theatre of the absurd, no wonder Newsbrooke is torqued, in afterburner and pulling vapes. Keep at it Ganesh. You do great work. Oh and if FOIman and his ilk want to return Newsbrooke to the USA, please do. Start a petition telling her to divorce her husband and move back home to a conquering hero’s welcome. Newsbrooke and her exploits make me proud of our nation. I don’t think there is an FOI Officer in the country who didn’t read that and go ‘been there, done that’. As for the person in question being Heather Brooke… well she may not be being deliberately obstructive but you would have thought such an known proponent of FOI could be a bit less obtuse and read between the lines. While the FOI officer may not have been explicit it was hardly rocket science to make the leap from the FOI officer emails to the necessary responses. I’m with you on this Lee. The first email “Would you please advise how we should handle it?” could, I suggest, be shorthand for “As you’re an expert there’s no need for us to explain that there is a possible exemption to be claimed at s40(2) but if you were to consent to disclosure that wouldn’t apply…so how should we handle it”. But isn’t it the FOIA officers job to treat everyone exactly the same? The fact that Heather Brook knows something about it is irrelevant. Surely there should of been a standard explanatory FOIA email to go to all employees whose information is required. She can it expect every employee to understand what is being requested and the decision process. Even people that have read the Act aren’t quite sure. I think it’s bad manners, but all too common in my experience with some academics. If Heather thought the officer was making a bad job of it, she could have helped her out – she’s a colleague, after all, and an expert in the field. Publishing the correspondence, with the officer’s name, seems nasty and petty. Colin…She isn’t be ‘a colleague’ of the Foi officer if she is a ‘visiting professor’. Only she isn’t – as she points out in the correspondence, she’s a Professor. And the website seems to confirm this. Visiting professor or otherwise does that exempt her from common courtesy? The fact is HB has a growing reputation for point scoring and for self promotion and this incident seems to fit that bill. I’ve never met her so I don’t know if the reputation is deserved or not but she does herself no favours by actions such as this. Lee, no it doesn’t exempt her, and she has an obligation to her colleagues and her institution. As Catherine says, you just don’t do that to ‘your own’, and most bosses will take a dim view. I think Newsbrooke HAS TO self promote. Point scoring? I think after getting around 150 MPs to stand down AND standing up to Julian Assange, Newsbrooke doesn’t need to be petty. We open gov’t guys are just mere mortals compared to even half of Newsbrooke’s accomplishments. I think if the staff involved in this exchange had published the correspondence without the authorisation of the University, they would be disciplined. I doubt this will happen to Brooke. I would also like to understand why What Do They Know are happy to be used as a vehicle for a high-profile academic to shame her colleagues publicly. We’ve kept the annotation up because we didn’t see any reason to remove it. It’s common for requests to be embarrassing for public bodies and their staff. The annotation is not part of the request, and is a method for Brooke to embarrass her colleagues. Nice of you to facilitate that. I admit I’m biased as an ex-FOI Officer. But this would have left me banging my head against the keyboard in frustration. Her first response is patronising and completely unhelpful, the rest of her correspondence sounds petty, rude, obstructive, and completely negative. It’s as if she assumes incompetence and deliberately ofuscates in order to prove herself right. Who exactly is being defensive? And yes – I agree it’s incredibly unprofessional that she’s publicly calling her colleagues and institution incompetent. It beggars belief. If one of my colleagues had done that to me I have no doubt my Director would be having ‘words’ about it with the relevant section head. As someone who is so big on FOI you’d think she’d make it as easy as possible for the FOI team to tick this one off their list rather than get on her high horse about it and actually as you say, needlessly delaying things further. Oh and by the way – one reason why it may have been emailed is because a data subject’s consent to disclose information that is usually exempted is best done in writing (i.e. by email). I’m sure Heather Brooke would be in favour of good record keeping? My colleague used to buy me cake when she saw me grinding my teeth over another ‘like getting blood out of a stone’ moment. I hope the unfortunate FOI officer in this case is being similarly well treated as she has my utmost sympathies. I know Newsbrooke. Big time. I sincerely wish to be respectful with you but to expect as the Freedom of Information Officer any confidentiality with your correspondence is theatre of the absurd. Back home in Washington State, USA what you call Freedom of Information Officers or we call Public Records Officers recognize to a soul they’re spokespersons for the public agency and on the public record. At the state government level we list them on the World Wide Web in the Washington State Register. As you probably realize I’m quite familiar with FOI ops back home and I’m Newsbrooke’s loudest fan. Furthermore, for the University’s FOI Officer to not initiate communication within one or two business days with the subject is the height of unprofessionalism. The goal should be to get the data to the requester and move forward, not delay & stall. No wonder Newsbrooke was torqued and pulling vapes. I understand however transparency in spokespeople/spokesholes may be a problem to your Brits. Said angelic superheroic professor did blast the Brit concept of unnamed spokespeople a while back. I also agree with Tim. If this is genuine, it is not a pleasant way for a member of staff to be treated especially with the power differentials and academic hierarchy creating an institutional imbalance. It is also worth noting that the first person sending the FOI request to the professor was not the organisation’s FOI officer. I would also point out that the professor’s book is not applicable to this situation. It is one thing to make an FOI request and investigate. It is quite another to get an organisation to respond to an FOI request and manage the transparency culture for a successful FOI programme. Getting a PhD and the work and sacrifice to do that is dwarfed by the work to create, develop, and maintain a moderately successful FOI culture as a junior officer. For a start, no one is actively trying to stop your PhD every day. Perhaps the professor could agree to be an FOI office at an average local government FOI system of about 100 requests a month for three months and see how well it goes and let FOI officers make a few requests and critique her approach to responding to (not preparing or investigating) FOIA requests. See how far “I am an expert” gets the professor when a senior officer or politician does not want a response written a certain way? (Cf Kirklees http://www.examiner.co.uk/news/west-yorkshire-news/kirklees-council-refers-mehboob-khan-4950870 or the Home Office http://www.bbc.co.uk/news/uk-politics-23633214) Perhaps the professor could explain why s.43 (2) doesn’t apply to an officer who believes that they will violate the supplier’s confidentiality clause if they disclose any of the contract to the FOI officer. The annotations do not benefit anyone and reflect poorly on the parties and the institutions. I would counsel it be removed. Like Tim, I agree that most of this could be resolved by telephone. Yet, the email trail tells its own story as it may be that people are less eager to use the telephone and rely on email or annotations for a reason. Thanks again for a stimulating and thought provoking post. I can’t wait for Newsbrooke to return to The Home Fleet, defend the Americana Realm, and make America more open, more happy, more optimistic. I also wish we Yanks would name an aircraft carrier after her. Sheer. Deterrence. Factor. Uh, Josef? I’m giving you that v for victory sign right back… shame you will be seeing the v the wrong way round. I define transparent government as victory. Exactiy. That’s the point. The FOIA officer didn’t know that she was a colleague. The point of sending out a standard email to everyone in this situation is that you don’t make blunders like that.